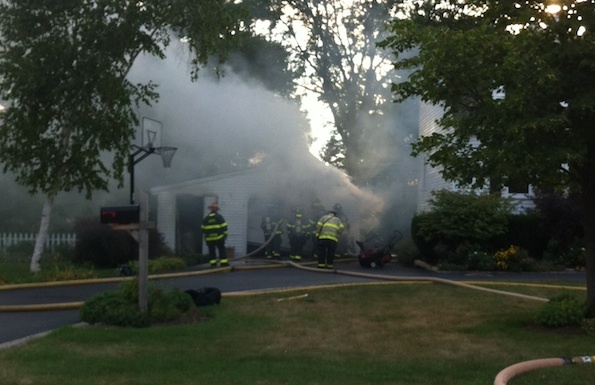 Garage fire on North Pine Avenue, Arlington Heights (Over 60 more photos on Facebook.com/CardinalEmergencies). Arlington Heights police and firefighter/paramedics responded about 6:56 PM Friday to a detached garage fire in the 2400 block of North Pine Avenue. Firefighters extinguished the fire about 7:15 p.m. One vehicle was destroyed while parked inside the garage. The garage fire was close enough to the house to cause a window to break, which alerted homeowners to the garage fire. Firefighters stopped the main fire within about three minutes, and immediately soaked the house just to the north of the garage to prevent the fire from ignited or damaging the house and siding. The fire was apparently started by barbecue coals that were mistakenly thought to be extinguished, and were placed in a garbage can, that was placed in the garage.